It is a programming language developed by Yukihiro “Matz” Matsumoto. Among the various types of programming languages, Ruby is ranked on the top ten due to its popularity. Although Rails are known for its use in web programming, it is recognised as a general purpose programming language. Rails refer to the software library expanding the Ruby Programming languages. It is developed by David Heinemeier. It is a software code added to the Ruby Programming language. It is a development tool providing web developer with a framework along with structures for each and every code written by them. Rails framework benefits developer with websites as well as applications as it abstracts and makes simpler general recurring works. Quick programming procedure compared to other framework and languages as the object-oriented character of Ruby and huge collections of Open source codes obtainable in the community of Rails. Due to readable and self-documenting Ruby codes, it is very productive as there is less required to write down separate documentation which makes easy for an additional developer to choose the present project. Rails are able to develop stronger focuses on testing along with a better testing framework. Rails along with its library are open source, thus contrasting from another commercial development framework, it does not include any licensing costs. One of the main advantages of Ruby on rails is the speedy development rate. It is said that the speed of development of the project is improved by 30-40% compared to other programming languages or framework. Most of the time boost in the speed is defined by a wide array of tools along with the Ruby languages. Either you are a project leader or a client, Ruby on rails is a very cost effective solution as its framework is available without any charge and perform smoothly on Linux. It is simple to work from developer’s perspective as well. The framework Ruby on Rails is truly perfect for developing different types of web applications. One of the fine things about this framework is working prototype is easily available which executes very speedily. This makes inspection on the feasibility of a project very easy and simple. Furthermore, developers are capable of fixing a web application early in the development phase. Along with being cost-effective the framework Ruby and rails lets you start from planning phase to actual development rapidly and is also simpler to handle than other additional technology. Alike the most successful as well as well recognised content management system Drupal and WordPress with the successful community, allowing them to flourish, same goes with the framework Ruby on rails as well. Ruby on rails community consists of lots of expert developer who continually focus on improving the code and helping other to make their project better. This signifies, if you require help in some part of development tasks, there is more change that one has developed something similar to your project and wants to help you to take you out of the problem which you may have. However, you still require a proficient team to perform with the code as it is not completely plugged and play but definitely guides a project to move ahead. When you get involved in the larger project, you need to test the project to make the project more efficient. Ruby on Rails framework consists of fine built-in test system compared to another available framework. Additionally, it also includes the original approaches, namely Behavior Driven Development (BDD) or else Test Driven Development (TDD). Caching includes an essential step in the development of most important internet projects. In PHP you can find different types of preference for data caching and these choices along with the tools are attached on the side. The framework Ruby on rails along with its basic configuration consists of a regular means of caching data. In the beginning of available tools to use data caching within the projects, you will be capable of caching the entire pages, the block of code, and query result along with Active record model. When someone completes the project and the all of the sudden recognises the necessities of the English version in order to carry on the development of the project. Ruby on rails supports the containment project and if you require support for various languages on the website initially, the framework Ruby on Rails is able to deal with various templates for various languages with the configuration files consisting of translation terms and numerous additional staffs the tool to make use of localisation project. Mostly in various PHP project, we can notice the picture at the time address specified page is large and difficult to understand. So, Ruby on rails project contains the complete flexibility to organise routeing, type address, names of foremost parts. It is likely to change the address fast in a single place deprive of changing this address to the whole project. Thus, Ruby on rail’s URLs are simple, attractive, and understandable as well as preferred by various search engines. 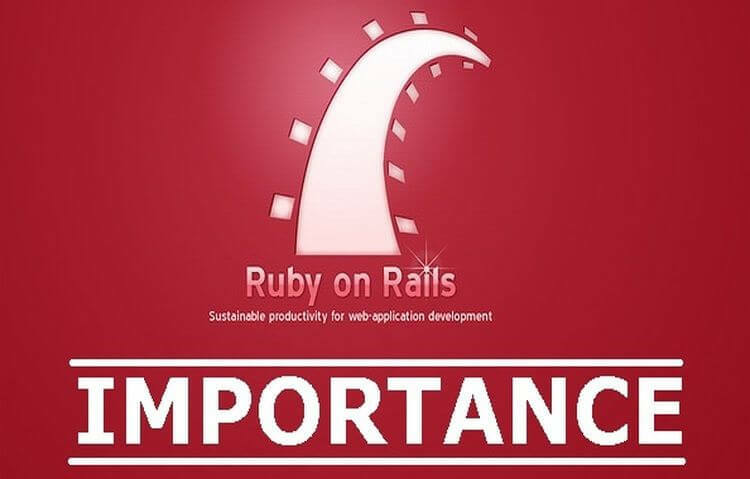 Each and every Input and validation of data is completely implemented by Ruby on rails. Users require filling up the form once verifying email address, password including the maximum length of login. Ruby on rails consists of an established tools that work together with the database. The organisation of the database is placed in an application code and is configured from the project. The structure of the code is always placed in the repository and if any changes occur, the structure is documented as well as tied to a particular command to the repository. I hope this article provided you with enough information regarding the framework Ruby on rails. Using Ruby on rails makes your web applications resourceful as well as useful by allowing the quick development of dynamic web solutions. So ruby has become the best choice of most of the web developers. Are you willing to develop your website using Ruby on rails framework? If yes, contact us.